Antennae Galaxies (NGC 4038 and NGC 4039) located in the constellation of Corvus had been originally similar to our galaxy the Milky Way and Andromeda Galaxy both in size and structure, but they already traversed each other once some hundred million years ago. A very similar collision will happen to Milky Way and Andromeda Galaxy in the far future. 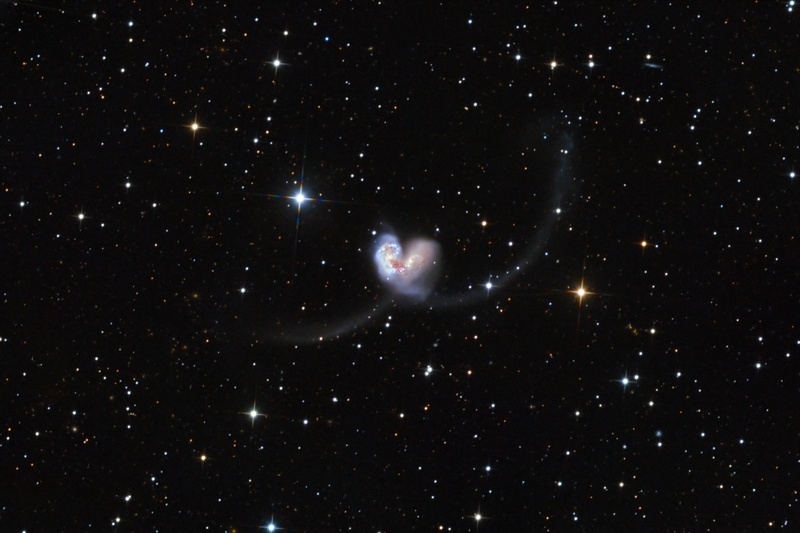 A "snapshot" of collision of two galaxies can be seen in the picture. This kind of collisions take several hundreds of million years or even more than a billion years, the history of mankind is just a moment compared to these time scales. Although it is not possible to observe consecutive phases of such collisions because of their duration, we can get a complex understanding of such interactions observing several interacting galaxy pairs being in different phases of their collision. It is a bit like trying to understand the ageing of humans by studying a photograph taken on a crowded street with people of different ages. Antennae Galaxies were discovered by William Herschel on the 7th of February in 1785, because of the compact size of them he catalogued them as a planetary nebula, he could not know their real nature. 48 years later his son, John Herschel entered the galaxies as two separate objects (h1052 and h1053) in his own catalogue. In the famous NGC catalogue (New General Catalogue of Nebulae and Clusters of Stars) published by John Louis Emil Dreyer in 1888 they got the IDs NGC 4038 and NGC 4039. In Halton Arp's catalogue of peculiar galaxies they can be found under number Arp 244. Their morphological classification is SB(s)m pec (NGC 4038) and SA(s)m pec (NGC 4039), both of them were spiral galaxies originally, with NGC 4038 having bars as well. None of them have polar rings, both are irregular and peculiar. Irregularity refers to the distortions caused by the collision. There are contradicting results regarding their distance. Distance calculations based on a supernova of type Ia in NGC 4038 (SN2007sr) resulted about 63 million light-years, while newer studies using red giants in the tails of the galaxies to determine their distance gave only 45 million light-years. Regardless which of the measurements are correct, Antennae Galaxies are the nearest interacting galaxies to us. About 1.2 billion years ago this two galaxies were completely separate galaxies, but too close to each other, thus by the gravitational interaction between them they were getting closer and closer to each other, until they collided about 600 million years ago. Galaxies are not solid bodies but group of stars orbiting a common centre of gravity, therefore the collision of them shouldn't be imagined as collision of two solid bodies, but more like a collision of two flocks of birds. The colliding galaxies traverse through each other whilst because of the strong gravitational forces their structure get distorted. Although the relative speed of Antennae Galaxies were quite high, many hundred km/s, it still took hundreds of million years for them to pass through each other, because of their vast size. The tails were formed approximately 300 million years ago. The huge mass of the galaxies drew millions of stars from each other creating the tidal tails of them. That moment can be observed in this image, the cores of the galaxies are about 30000 light-years from each others, which is a bit less than the diameter of Milky Way. In another 400 million years the cores will unite and a giant elliptical galaxy will be formed around it. A part of the stars torn out will fall back into the new galaxy, while the rest will be moving away forever. The fate of Milky Way and Andromeda Galaxy will be very similar to that. Our galaxies are currently separate from each other, but in 4 billion years they will collide in a similar way to Antennae Galaxies, until they will form a giant elliptical galaxy at the end. A collision of two galaxies does not only result the realignment of their stars. In interacting galaxies, like in Antennae Galaxies, several star forming waves can be observed. The pressure and temperature is increasing in hydrogen clouds colliding to each other, which triggers formation of new stars in them. In images created by Chandra X-Ray Observatory several dozen of bright compact X-Ray sources can be identified: they are high-temperature accretion discs around neutron stars and black holes, remains of heavy stars formed by the collision, which collapsed at the end of their very short life because of their high initial mass. Other results of Chandra reveals that Antennae Galaxies contain high amount of heavier elements too: magnesium, neon and silicon which are needed to form habitable planets.